School-leaving certificate, Otto Hahn grammar school, Nagold, 1985. Studied politics and empirical cultural affairs at Tübingen. Activist in the peace and anti-nuclear movement since the 1980s. 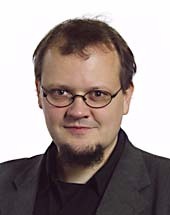 Personal assistant for two Green Members in the Baden-Württemberg Regional Assembly on anti-nuclear affairs, energy and peace policy from 1989 to 1993. In 1996 founded and set up Information Agency on Militarisation (IMI) e.V., IMI Executive member and spokesman at home and abroad. Editor of the online magazine IMI-List (approx. 1 000 subscribers). Scholarship from the Rosa Luxemburg Foundation, January-December 2002. Active member, attac research committee since late 2002. Participated and lectured at European Social Forums in Florence (2002), Paris (2003), London (2004) and the World Social Forum in Mumbai (2004). Active member, DFG-VK (German peace association - united opponents of war, http://www.dfg-vk.de); member, BUND (Association for Nature and Environmental Protection); member of VCD (Germany transport club); member, VVN-BdA (Association of Victims of the Nazi regime - Anti-fascist Federation); member, ver.di trade union (Subject area 8 in Baden-Württemberg); member, dai (German-American Institute, Tübingen); Executive member Information Agency on Militarisation e.V. ; member, Rosa Luxemburg Foundation; member, Rosa Luxemburg Forum, Baden-Württemberg. Spokesman for the Baden-Württemberg, Bavaria, Rheinland-Pfalz and Saarland PDS regional associations. GUE/NGL Group coordinator on Subcommittee on Security and Defence (SEDE); member, European Parliament Peace Initiatives Intergroup.